It took us 8 months to complete it. We put all of our knowledge about marketing a business online and off into it. In total, it ended up being over 1,700 pages. I showed it to several customers and associates … well, 500 pages of it, that is. It was overwhelming in one 3 inch binder, imagine me bringing out 3 of them! Business owners won’t read it, it’s too long. It’s not in a format that business owners will use. It’s the best system money can buy! 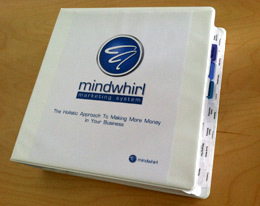 We realized that all of the blood, sweat, and tears we put into the Mindwhirl Marketing System was too valuable to simply let wither on the vine. As our company became more and more involved in training others to achieve the success that we have, we realized that it was time to open the entire system up to the public again. This time, however, we have developed a video training course which guides you through the most important points of marketing your business online and off. We are currently in the process of developing this course as video training. We will have three levels of commitment: Silver, Gold, and Platinum. Silver level includes: The video training, which is expected to be over 15 modules. Gold level includes: The video training and complete plug-and-play marketing calendars and campaigns for 4 different types of businesses. You could take them and start using them the very next day. Platinum level includes: The video training, the plug-and-play marketing calendars and campaigns for 4 different types of businesses and 20 hours of marketing coaching. Each level is worth way more than the asking price (TBA). This is a complete system that you can use with any business. This system is the tool we have been using with our companies, and our clients companies to achieve amazing sales increases year after year. If you are interested in learning how to market your business online and off, register your interest in the form below and you will be notified when we release the product to the public. If you have any questions in the meantime, don’t hesitate to contact us!